Repost from our review of "The Love Witch" from 7/17. The film is now playing in theaters in limited release and VOD. Lately, yours truly has been watching a lot 60’s and 70’s horror films that have had a European feel to them. When I first heard of “The Love Witch”, my first thoughts was it must be European horror film as the stills and the trailer had the look of it. But no, this was made here in America and it’s a new film that is being released here later this year. 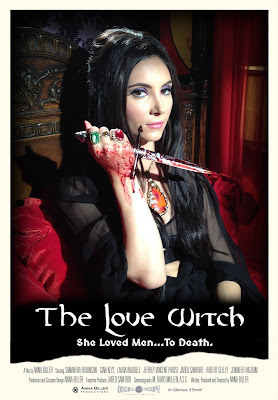 Still, the look and the trailer of the film is what drew me to “The Love Witch”. The film is about a beautiful woman (Samantha Robinson) who moves to a new town looking for the man of her dreams. In her spare time, she lives in a gothic looking apartment and she picks up men to seduce. Soon, her love portions leave a string of dead men. When she finally meets the man of her dreams, her desperation takes a dark turn as it leads her to insanity and murder. When the film ended, I was surprised that I enjoyed this one considering its running time and had a weird obscure vibe to it. Sometimes it can be tough to watch. Then again, I’ve been watching euro-horror films lately and this had that vibe that made me enjoy this film a lot. “The Love Witch” is film that captures the Jesus Franco/Jean Rollin vibe with the look of the film and its approach. Most of that had to do with the directing and writing of Anna Biller. One of the things that Biller does right was to make the look of the film stand out. The look of the film had the feel of an early 60’s European horror film feel to it. Biller and her cinematographer does a great job making sure it has its unique look as it adds to the film and makes the supernatural elements work. The other thing that Biller does very well is to make sure the acting fits the film’s surreal tone. She makes sure the cast does a very good job making their characters are entertaining and interesting. The performances helped keep my interest with what was going on in the story. Speaking about the performances, I thought Samantha Robinson’s was the best thing about this film. I liked how she makes her character so hypnotizing and charismatic as she makes the film’s main character Elaine stand out from all the other characters. It grabs your attention every time she’s on screen. It’s something that’s needed for a main character to grab your attention. The screenplay also written by Billing was very good. I liked how she goes for originality with the way that she approaches the story. Whether it’s the way she came up with the ideas to focusing on the dark witch elements, everything had a bizarre feel of a late 60’s/early 70’s European occult film. It makes it feel original because the euro-horror approach is rarely done in U.S. horror films. The other thing that I liked was the fact that it does a great job focusing on its main character. Whether it’s the way the main character approaches her soon to be lovers to her backstory, Biller does a very good job making sure it keeps you interested in the character and the story. I had a very good time with “The Love Witch” as it has the feel of a Jess Franco or Jean Rollin film. With its stunning cinematography and great performance from Samantha Robinson, you will fall under the spell of “The Love Witch” as it will leave you hypnotized. 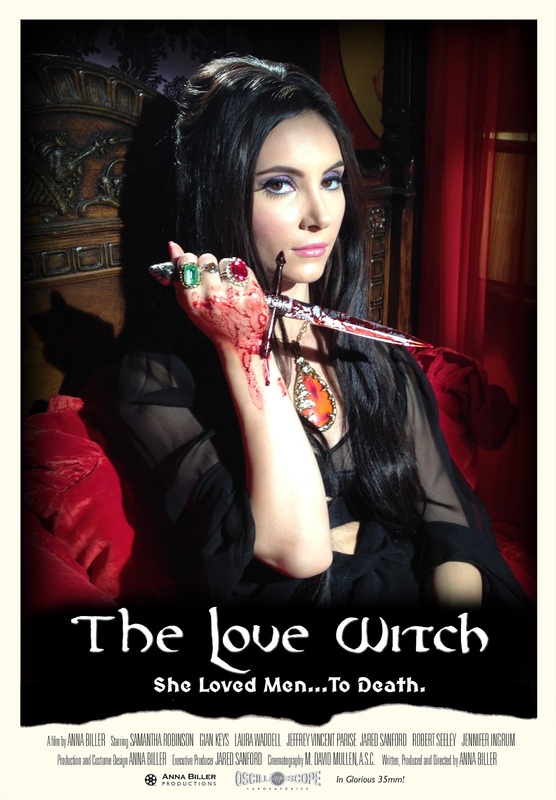 “The Love Witch” will be hitting theaters in limited release in the U.S. in October.